November 16, 2015 "Information Clearing House" - "The Intercept" - Whistleblowers are always accused of helping America’s enemies (top Nixon aides accused Daniel Ellsberg of being a Soviet spy and causing the deaths of Americans with his leak); it’s just the tactical playbook that’s automatically used. 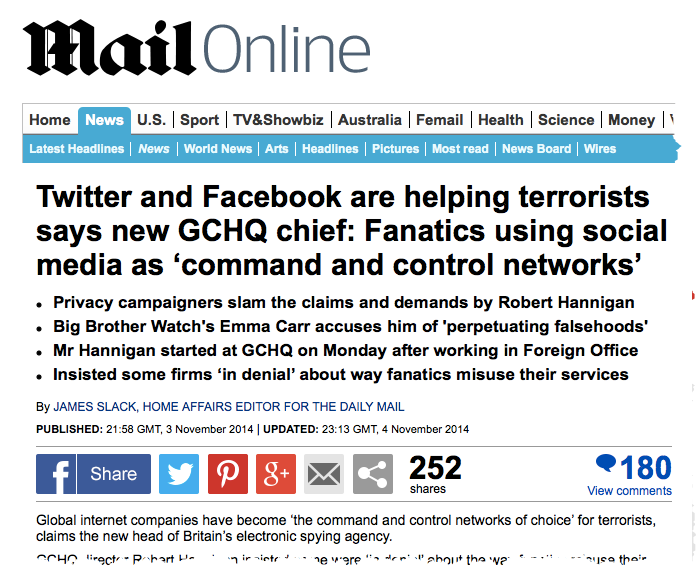 So it’s of course unsurprising that ever since Edward Snowden’s whistleblowing enabled newspapers around the world to report on secretly implemented programs of mass surveillance, he has been accused by “officials” and their various media allies of Helping The Terrorists™. Still, I was a bit surprised just by how quickly and blatantly — how shamelessly — some of them jumped to exploit the emotions prompted by the carnage in France to blame Snowden: doing so literally as the bodies still lay on the streets of Paris. 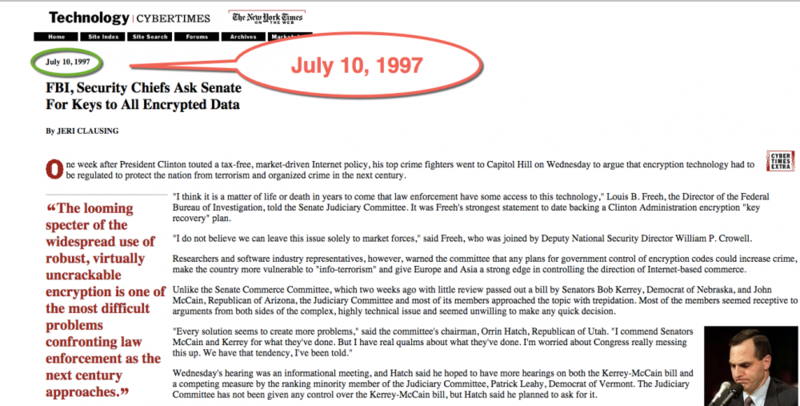 At first, the tawdry exploiters were the likes of crazed ex-intelligence officials (former CIA chief James Woolsey, who once said Snowden “should be hanged by his neck until he is dead” and now has deep ties to private NSA contractors, along with Iran–obsessed Robert Baer); former Bush/Cheney apparatchiks (ex-White House spokesperson and current Fox personality Dana Perino); right-wing polemicists fired from BuzzFeed for plagiarism; and obscure Fox News comedians (Perino’s co-host). So it was worth ignoring save for the occasional Twitter retort. But now we’ve entered the inevitable “U.S. Officials Say” stage of the “reporting” on the Paris attack — i.e., journalists mindlessly and uncritically repeat whatever U.S. officials whisper in their ear about what happened. So now credible news sites are regurgitating the claim that the Paris Terrorists were enabled by Snowden leaks — based on no evidence or specific proof of any kind, needless to say, but just the unverified, obviously self-serving assertions of government officials. But much of the U.S. media loves to repeat rather than scrutinize what government officials tell them to say. So now this accusation has become widespread and is thus worth examining with just some of the actual evidence. One key premise here seems to be that prior to the Snowden reporting, The Terrorists helpfully and stupidly used telephones and unencrypted emails to plot, so Western governments were able to track their plotting and disrupt at least large-scale attacks. That would come as a massive surprise to the victims of the attacks of 2002 in Bali, 2004 in Madrid, 2005 in London, 2008 in Mumbai, and April 2013 at the Boston Marathon. How did the multiple perpetrators of those well-coordinated attacks — all of which were carried out prior to Snowden’s June 2013 revelations — hide their communications from detection? This is a glaring case where propagandists can’t keep their stories straight. The implicit premise of this accusation is that The Terrorists didn’t know to avoid telephones or how to use effective encryption until Snowden came along and told them. Yet we’ve been warned for years and years before Snowden that The Terrorists are so diabolical and sophisticated that they engage in all sorts of complex techniques to evade electronic surveillance. By itself, the glorious mythology of How the U.S. Tracked Osama bin Laden should make anyone embarrassed to make these claims. 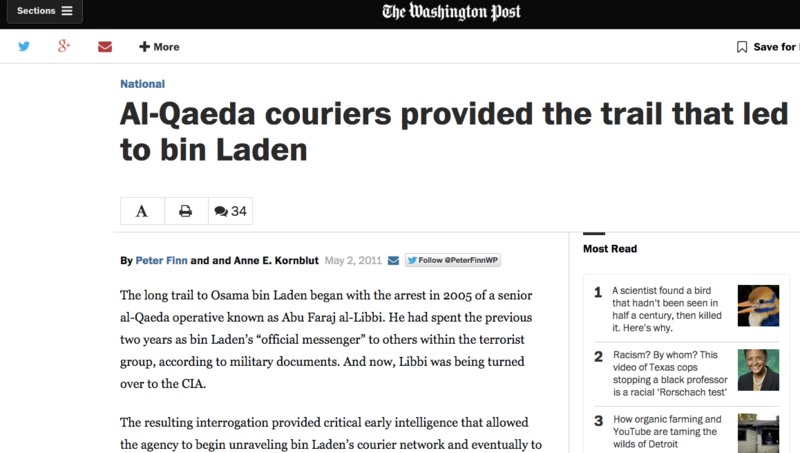 After all, the central premise of that storyline is that bin Laden only used trusted couriers to communicate because al Qaeda knew for decades to avoid electronic means of communication because the U.S. and others could spy on those communications. Remember all that? Zero Dark Thirty and the “harsh but effective” interrogation of bin Laden’s “official messenger”? The looming spectre of the widespread use of robust, virtually uncrackable encryption is one of the most difficult problems confronting law enforcement as the next century approaches. At stake are some of our most valuable and reliable investigative techniques, and the public safety of our citizens. We believe that unless a balanced approach to encryption is adopted that includes a viable key management infrastructure, the ability of law enforcement to investigate and sometimes prevent the most serious crimes and terrorism will be severely impaired. Our national security will also be jeopardized. 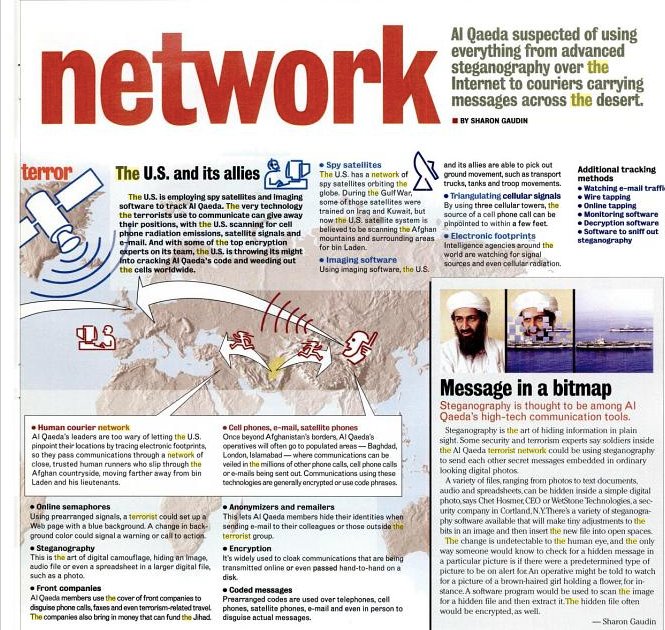 How dumb do they think people are to count on them forgetting all of this, and to believe now that The Terrorists only learned to avoid telephones and use encryption once Snowden came along? Ironically, the Snowden archive itself is full of documents from NSA and its British counterpart, GCHQ, expressing deep concern that they cannot penetrate the communications of Terrorists because of how sophisticated their surveillance-avoidance methods are (obviously, those documents pre-date Snowden’s public disclosures). In light of all this, how can “officials” and their media stenographers persist in trying to convince people of such a blatant, easily disproven falsehood: namely, that Terrorists learned to hide their communications from Snowden’s revelations? They do it because of how many benefits there are from swindling people to believe this. To begin with, U.S officials are eager here to demonize far more than just Snowden. They want to demonize encryption generally as well as any companies that offer it. Indeed, as these media accounts show, they’ve been trying for two decades to equate the use of encryption — anything that keeps them out of people’s private online communications — with aiding and abetting The Terrorists. 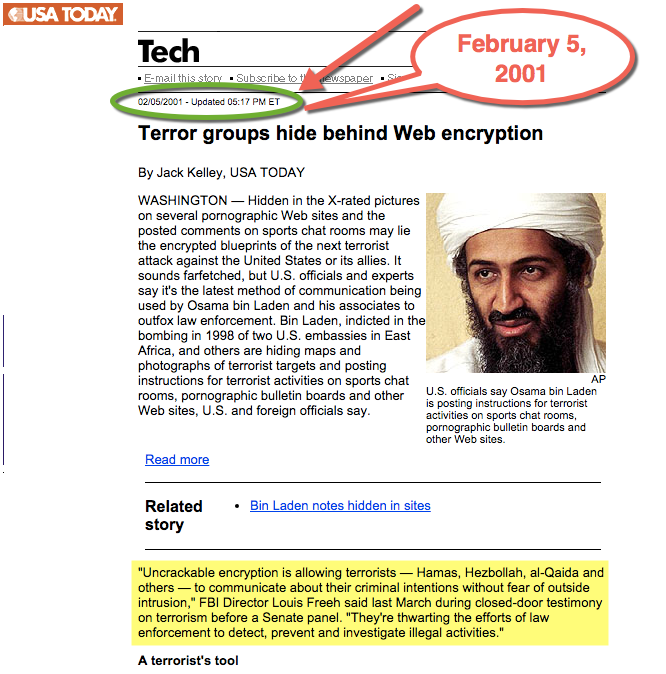 It’s not just Snowden but also their own long-time Surveillance State partners — particular Apple and Google — who are now being depicted as Terrorist Lovers for enabling people to have privacy on the internet through encryption products. Then there’s the blame-shifting benefit. For most major terror attacks, the perpetrators were either known to Western security agencies or they had ample reason to watch them. All three perpetrators of the Charlie Hebdo massacre “were known to French authorities,” as was the thwarted train attacker in July and at least one of the Paris attackers. These agencies receive billions and billions of dollars every year and radical powers, all in the name of surveilling Bad People and stopping attacks. So when they fail in their ostensible duty, and people die because of that failure, it’s a natural instinct to blame others: Don’t look to us; it’s Snowden’s fault, or the fault of Apple, or the fault of journalists, or the fault of encryption designers, or anyone’s fault other than ours. If you’re a security agency after a successful Terror attack, you want everyone looking elsewhere, finding all sorts of culprits other than those responsible for stopping such attacks. Above all, there’s the desperation to prevent people from asking how and why ISIS was able to spring up seemingly out of nowhere and be so powerful, able to blow up a Russian passenger plane, a market in Beirut, and the streets of Paris in a single week. That’s the one question Western officials are most desperate not to be asked, so directing people’s ire to Edward Snowden and Apple is beneficial in the extreme. By destroying the Iraqi state and setting off reverberations across the region that, ultimately, led to a civil war in Syria, the 2003 invasion created the conditions in which a movement like ISIS could thrive. 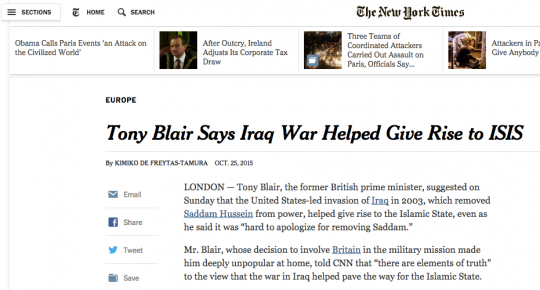 And, by turning public opinion in the United States and other Western countries against anything that even suggests a prolonged military involvement in the Middle East, the war effectively precluded the possibility of a large-scale multinational effort to smash the self-styled caliphate. Given all this, is there any mystery why “U.S. officials” and the military-intelligence regime, let alone Iraq War-advocating hacks like Jim Woolsey and Dana Perino, are desperate to shift blame away from themselves for ISIS and terror attacks and onto Edward Snowden, journalism about surveillance, or encryption-providing tech companies? Wouldn’t you if you were them? Imagine simultaneously devoting all your efforts to depicting ISIS as the Greatest and Most Evil Threat Ever, while knowing the vital role you played in its genesis and growth. The clear, overwhelming evidence — compiled above — demonstrates how much deceit their blame-shifting accusations require. But the more important point of inquiry is to ask why they are so eager to ensure that everyone but themselves receives scrutiny for what is happening. The answer to that question is equally clear, and disturbing in the extreme. Glenn Greenwald is a journalist, constitutional lawyer, and author of four New York Times best-selling books on politics and law. His most recent book, No Place to Hide, is about the U.S. surveillance state and his experiences reporting on the Snowden documents around the world. Prior to his collaboration with Pierre Omidyar, Glenn’s column was featured at The Guardian and Salon. He was the debut winner, along with Amy Goodman, of the Park Center I.F. Stone Award for Independent Journalism in 2008, and also received the 2010 Online Journalism Award for his investigative work on the abusive detention conditions of Chelsea Manning. For his 2013 NSA reporting, he received the George Polk award for National Security Reporting; the Gannett Foundation award for investigative journalism and the Gannett Foundation watchdog journalism award; the Esso Premio for Excellence in Investigative Reporting in Brazil (he was the first non-Brazilian to win), and the Electronic Frontier Foundation’s Pioneer Award. Along with Laura Poitras, Foreign Policy magazine named him one of the top 100 Global Thinkers for 2013. The NSA reporting he led for The Guardian was awarded the 2014 Pulitzer Prize for public service. 40 states financing Daesh terror group, says Russian president: Russian President Vladimir Putin says financing for the Takfiri Daesh terrorist group comes from dozens of countries, including some G20 member states.